About 5 months ago I fixed my wine refrigerator/cheese cave and I was extremely happy with it. Against all odds it worked better than ever. But of course my happiness could not last forever. And the timing was not great. 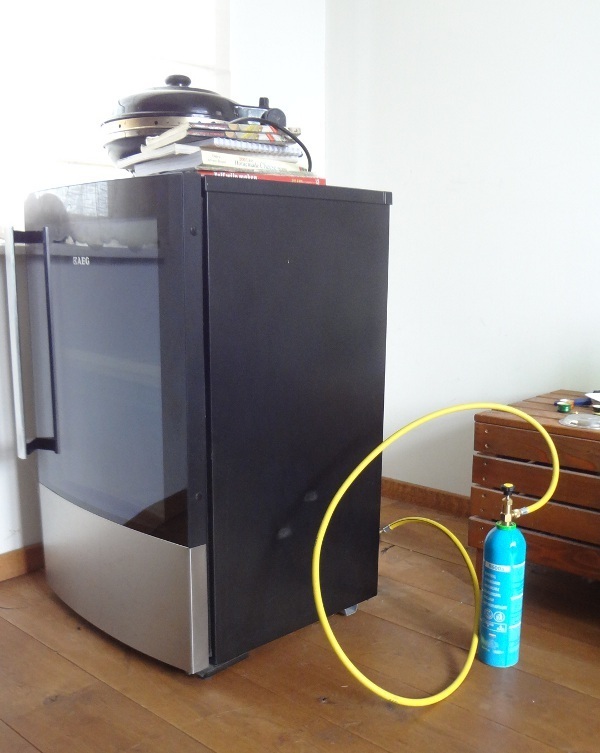 I was making a Münster, the king of stink, and so I needed to keep the temperature at 16 C for a while. The refrigerator was only in use for red wine and seemed to be working fine. But when I placed the cheese in it and switched to 16 C I noticed that there was a problem. Again the motor became very hot and the sides of the machine remained cold. The coolant had leaked out. At first I was not worried. It worked for 5 months and I can add coolant very easily. If you have to do that every 5 months it is not much of a problem. So I added coolant and the machine was working again. For 1 day. Since I spent a lot of time and money on it I am “a bit” disappointed. Now I have to face the fact that I am defeated. Another failure. It is a sad day and the refrigerator needs a breathing apparatus to stay alive. Well, it isn’t all bad. I learned some things and I was happy and proud of my first success. Later everything turned out good. I found that the problem was the cap of the filler tube. It was leaking. Now the refrigerator is working again for almost a year.